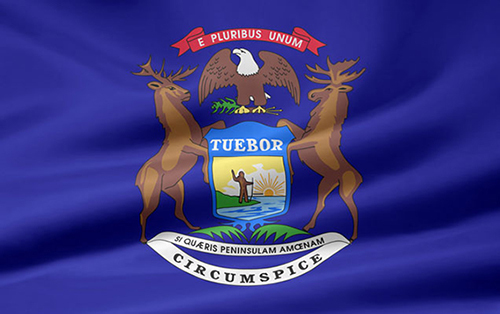 The Michigan flag was designed by Marie Elizabeth Watkins Oliver and was adopted as the official Michigan State Flag on March 22, 1913; almost 92 years after Michigan became the 24th State to join the union. 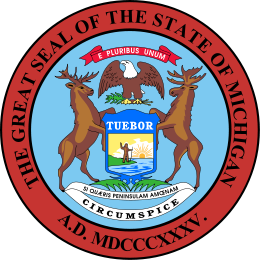 The state seal shows a large star which represents the north star, and nineteen smaller stars which mean that Minnesota was the nineteenth state to join the union after the original thirteen. The date of admission, 1858, appears along with 1819, the first settlement, and 1893, the first flag adoption. There is a settler plowing his field, and an Indian riding into the sunset. The words on the flag, "L. Etoile du Nord" are French for "The North Star." The stump with an ax in it, and the pine trees stand for lumbering and the state tree. Framing the seal is the state flower.